This is it! The first half of the season is in the books, and we've been graced with a nice break before games resume on Friday. Well that's what we'd be saying if we didn't just love this sport. 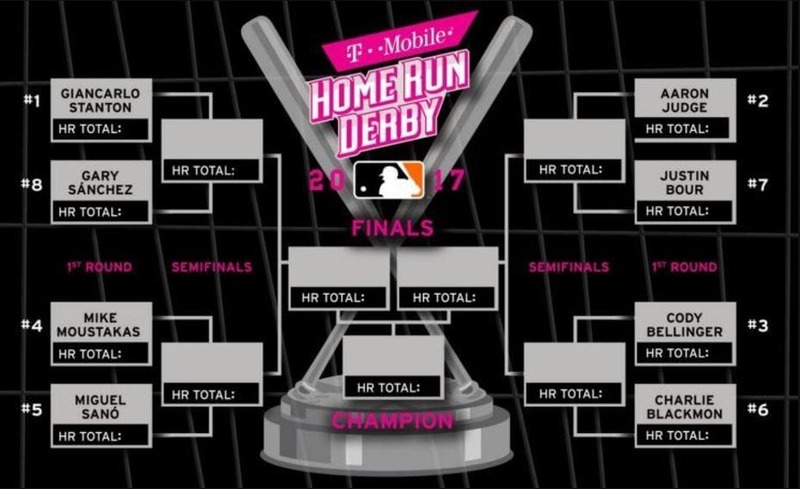 There's no breaks for us as we're going hard on Monday with the Home Run Derby brought to you by T-Mobile and the All-Star Game on Tuesday! The Florida Marlins' Giancarlo Stanton is the defending champ after his performance in Petco Park last season, but he's up again some stiff competition in this one. Most notable among these is the New York Yankees' Aaron Judge, who is breaking records of his own. Odds are brought to you by Sports Interaction, so be sure to get your picks in! We'll be honest with you. We would have to be fools to take Sanchez in this spot, right? Well we're the town fools then, because at +280 Scary Gary is worth a shot. The competition favorites always seem to disappoint, and in the shadow of New York Yankees teammate Aaron Judge, Sanchez will be a lot more motivated than Stanton. Again, this is a value play. We know Sanchez isn't more likely to hit more HRs, just that he has more chance than the odds dictate. Mike Moustakas seems resurgent for the Kansas City Royals after missing most of last season. His 25 HRs this year are already more than he's hit in complete seasons going back to his debut in 2011. The 215lber is up again the Twins' Miguel Sano, who's also having a breakout season, almost matching his HR total from all last season. This match could go either way, but Moustakas' contrast to his previous seasons is something to note. We'll go with the dog again for this at +165, if only because he's scored 4 more HRs in slightly more ABs than Sano. Another Yankees versus the Fish matchup finds the 2nd seeded Aaron Judge against Justin Bour. Though Judge has 30 HRs this season already, he will most likely not be as motivated for this Derby. Bour, on the other hand, is playing in front of home fans at Marlin Park, and has nothing to lose coming in at 7th seed. Seems like a bad move, but taking the dog here again at +240 is the play. With a phenomenal rookie year, Los Angeles Dodgers' Cody Bellinger already has 25 HRs off 65 hits. He and Charlie Blackmon are quite familiar with each other as NL West rivals, but with the Rockies slumping recently, and Blackmon seemingly having peaked already, Bellinger should take this one easily. This is the only chalk we're eating at -265. For the outright winner, we see the defending champ as favorite, followed by the Yankees' Aaron Judge, then a steep dropoff before the Dodgers' Cody Bellinger, the Twins' Miguel Sano, the Royals' Mike Moustakas, the Yankees' Gary Sanchez, the Marlins' Justin Bour, and finally the Rockies' Charlie Blackmon. Using sabermetrics and advanced stats, we find there's hardly any value in these picks, as their WAR and offensive numbers are all quite high. Trends are a different story though, and they don't seem to favor the favorites, ironically. In terms of the human component, we believe Gary Sanchez will have the most to prove, and wouldn't it be a great Derby to see Sanchez and Judge in the final round. Justin Bour might also be a good play at +1600 in front of the home crowd. Bour and Sanchez should go further than we expect. Moustakas could be a sleeping giant at +1600 so a play might be warranted too. The game starts soon so get to Sports Interaction and get the best value for your picks.